had his staff place a coffee maker on his breakfast tray every single day. At least, until the war called for rationing, and FDR followed this rule as well and slowly switched to drinking milk. 33) Harry S Truman: the Trumans were discerning coffee drinkers as well. Mrs Truman was known to inspect a coffee’s color in a spoon, as well as occasionally send White House aides to teach kitchen staff how to make coffee to their liking. 34) Dwight D Eisenhower: he was said to have drank endless cups of coffee to get through D-Day, which is totally understandable. As president at one point had the Federal Trade Commission investigate coffee prices rising too. 36) Lyndon B Johnson: Johnson spoke to Congress urging them to renew the International Coffee Agreement that was signed between 60 nations with the intention of mutual cooperation and helping ease the spike in prices for coffee that had long been an issue with American consumers. It just goes to show you how important a beverage coffee is. how they planned to put LSD in Nixon’s coffee. Thankfully this did not go through. Nixon was not a crook when it came to coffee. It was a well known fact that he offered coffee to all of his visitors and drank it with them himself, which almost led to this LSD story actually occurring. 38) Gerald Ford: Gerald Ford didn’t have anything particularly interesting about coffee, except that it was one of his favorite drinks, and he’d brew his own coffee and toast his own English muffin for breakfast. 39) Jimmy Carter: Carter had his morning routine down pat. He would get up at 5:30am and start his day with freshly squeezed juice and coffee. Carter also got some pressure about rising coffee Prices. He was questioned by the famous reporter Walter Cronkite on the rising price of coffee and wanted to know what Carter intended to do about it. 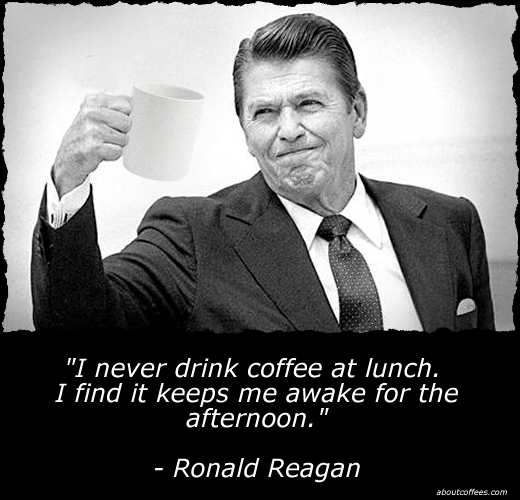 40) Ronald Reagan: Reagan was known as “The Great Communicator” but he was not “The Great Caffeinator.” He would start his days with coffee like most other people. However, he started his days decaf coffee, for some odd reason. Are you ready to be presidential and start your own coffee stories? We offer subscriptions with delicious snacks that you should check out.